Whether it’s learning to ski or how to sew a straight seam, a great teacher shows contagious enthusiasm while breaking down the skill into manageable pieces. Becky Spratford is no exception. An authority on readers’ advisory, well-known presenter, and author of the blog RA for All, she provided a wealth of RA guidance during our e-mail interview (March 6, 2017). Public Libraries Online: Whenever someone is known as an expert on something, I’m always curious about the path that led there. Would you share a quick recap of how you became an RA guru? Becky Spratford: While I was in library school getting my master’s degree, on a whim, I took an elective class on Readers’ Advisory (RA). I thought it would be fun, but little did I know it would be one of the best decisions of my life. That class was the first time I had ever heard of being a professional leisure book suggester. Then, about a year later, while in my last semester, I applied for an opening to create an RA Department from scratch at the Berwyn [IL] Public Library. I wasn’t even sure if RA was all I wanted to do when I went to Berwyn; I didn’t think it would be intellectually stimulating enough. But it was too good of an opportunity to turn down, and good thing too, because boy, was I wrong. My director gave me the room to make the RA Department what I wanted it to be. She gave me a place to grow and learn to the point at which now I am writing the textbooks, leading the RA seminars, and writing an RA blog that is listed in textbooks. I went from not being sure, to being THE expert. And I have never been bored a day since. I wrote more about those early years and the librarian who posted that opening as a memorial to her after her death here on my blog. PL: Based on the presentations you’ve given on Readers’ Advisory, what’s one thing that tends to elicit an “aha” moment in the audience? BS: People seem to think they can’t possibly do RA without having read the book they are suggesting to the person in front of them. To get them over this hump, I have people start with an all-time favorite book and have them describe why they love it to a colleague but the catch is they can only use adjectives and not describe the plot at all. This forces them to get comfortable with describing WHY a book is enjoyed without the crutch of plot, but the “aha moment” comes when it is their turn to listen to their colleague describe why he or she loves their book. By listening, the trainee begins to see how WHY we all like the books we do is the point of RA. When you remove the genre and plot specifics, you are left with the essence of the story and how it makes the reader feel. That is something every reader can understand and relate to. Even if the paired up colleagues have completely different reading tastes, they can hear and feel each other’s enthusiasm for the stories they love. It is that feeling we try to match as we work with readers, not a specific title. Providing RA is as much about listening to others describe a book as it is about being able to book talk a perfect match. When people realize that, at its essence, RA begins as a conversation about books and reading, likes and dislikes, it all seems easier. That is something we all already do. I show them that they already know a lot more than they think they do. After this breakthrough, they have confidence to try it with patrons. Then all it takes is practice to improve. PL: Many of us probably think of Readers’ Advisory as being strictly a one-on-one conversation that takes place at a desk or in the stacks. Beyond book lists, are there other activities we should look at as ways to extend our RA reach? 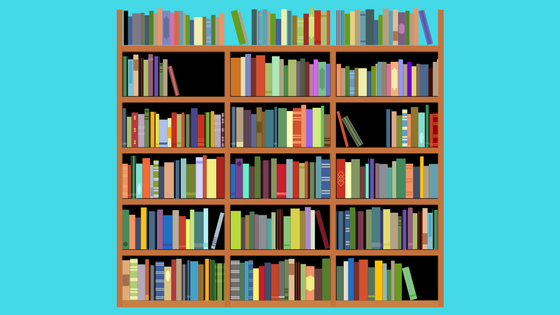 Create a library Goodreads shelf and have staff members post the books they are already reading with a sentence or two about what kind of reader would like it. The compound interest of multiple staff members contributing really adds up quickly. Plus patrons are already on Goodreads posting their books. They will be thrilled, and probably a bit surprised, to see you there too. One of my favorite tricks is to really surprise patrons with unexpected RA service by putting read-alike suggestions at the end of the books they are reading. Did you enjoy reading The Golem and the Jinni by Helene Wecker? You may also enjoy these other titles from our collection. For those who want another tale of magical realism with amazing world-building, fluid storytelling, and a tone which, while darker is infused with an overwhelming sense of hope, try Erin Morgenstern’s The Night Circus. The People of the Book by Geraldine Brooks is a good choice for readers who want another novel featuring Jews and Arabs working together to save something precious. Brooks’ tale alternates between the past and the present, but features a similar magical tone and a look into the customs, traditions, and ways of those who came before us. All you have to do is make a template for sizing and then have any and all staff contribute. Ask them to pick a book in the collection they have read and give you their read-alikes [the books this book reminded them of]. Each staff member can write as little or as much about the whys as they want. The key is to get these lists affixed into the back of as many books as possible. Patrons love finding them and as a result, finding their next good read. Finally, don’t underestimate the power of staff talking to each other at the service desk about books, movies, TV shows, graphic novels, etc. As long as it can be checked out at your library, staff should be encouraged to talk about why they like these items that they consumed in their own leisure time. It makes for good book sharing practice and it serves as an advertisement for your willingness and ability to offer leisure reading and viewing matches to your patrons. Many patrons are afraid to “bother” us with their leisure requests. If we are already sharing our own leisure reads with each other, our patrons will be more willing to come talk to us about their needs too. Yes, believe it or not, talking to each other at the desk is RA too. Check back next month for more insight on Readers’ Advisory from Becky.